Copyright (c) 2016 CBS Studios Inc. All Rights Reserved. 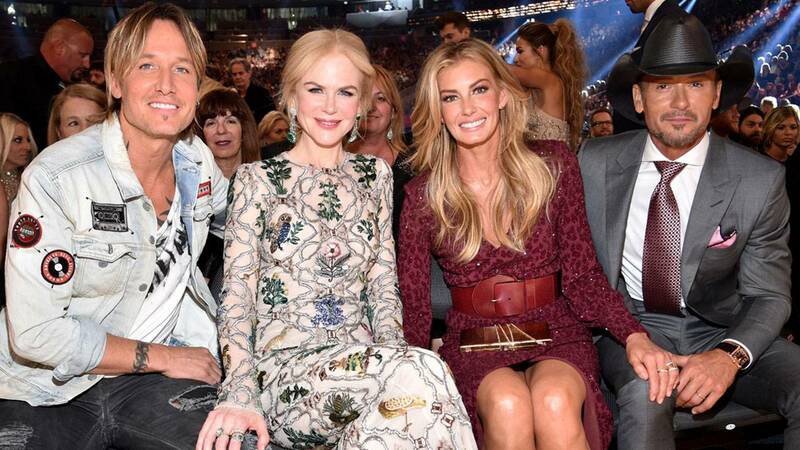 Nicole Kidman and Keith Urban might have been the cutest couple at the Academy of Country Music Awards in Las Vegas on Sunday, tied only with Faith Hill and Tim McGraw. So you can imagine how epically adorable it was when both couples hung out together, dancing and hugging the night away. PHOTOS: 2017 Academy of Country Music Awards -- See the Stars on the Red Carpet! Kidman and her country crooner hubby -- who was nominated for seven awards including Album of the Year for Ripcord, Song of the Year and Entertainer of the Year -- could not have been having better night, partying with their fellow country couple. Even though Urban and McGraw were up for awards in two of the same categories -- Song of the Year and Single Record of the Year -- there wasn't any animosity between the adorable foursome. Hill and Kidman looked particularly close, sitting side by side and holding hands. ET's Sophie Schillaci caught up with Kidman and Urban on the carpet before the show where the "Blue Ain't Your Color" singer opened up about leading the night's pack of artists with the most nominations. "That's never happened to me, ever," Urban marveled. "That's an absolute first. No, the success of this album, Ripcord, been beyond anything we could've imagined." However, Urban's taken home quite a few trophies in the past, and he revealed where he keeps all the accolades. "I have a lot in my closet," Urban admitted. "And my mom has a lot, too, which is really sweet. She loves them." The dynamic duo also opened up about their love for Jennifer Lopez and her Las Vegas residency show. "You have to see her show. She's amazing!" Kidman gushed, going on to call Lopez "a goddess." Check out the video below to hear more.